To-day is the last day of Dr Mahathir as Prime Minister of Malaysia. 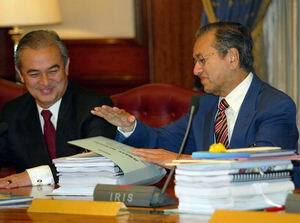 May I take this opportunity to thank Dato' Seri Dr Mahathir and wish him a happy retirement. At the same time, may I welcome Dato' Seri Abdullah Badawai as the new prime minister. May Allah swt guide you Pak Lah to lead our country to a better future. PS:Now Dr Mahathir is Tun Dr Mahathir Muhamad. PS: I have set up a photoblog for Ramadhan that requests your contribution.Your participation is greatly appreciated. Jazakallahu Khairan. I was glad to read in the newspapers front page yesterday about our PM speech at the UN. He called for more democratic process at the UN Security Council.And that reminded me of the famous qoute by George Orwell in his book The Animal Farm," All animals are equal.But some animals are more equal than others".It is still true until to-day. When I was in the Upper six in 1972, my teacher Cikgu Faridah asked us to write about the same thing-the UN roles in maintaining world peace and order.We discussed what UN should be and that it.As a young man at that time, I was very idealistic and hoped for a better world during my life time.Alas,looking back for the past three decades, the sum total of the wars and human miseries must, IMHO ,HAVE exceeded the WW11!